Do you get chills not just from the fridgid temperatures but also by thinking about your utility bills during these winter months? If your answer to a drafty home is to simply crank up the furnace, you'll not only pay for it, but you could also be wasting energy and depleting more natural resources in the process. 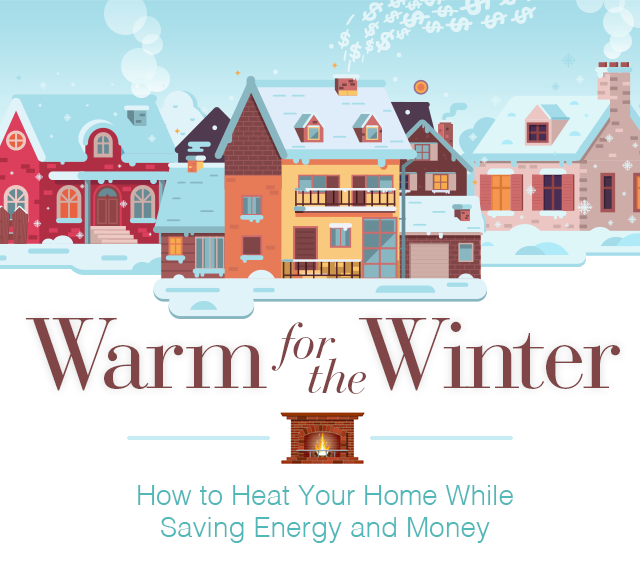 Instead of making your heater work overtime, here are ways you can reduce your energy consumption and still keep your home warm and toasty this winter. According to the Environmental Protection Agency (EPA), heating accounts for 45% of energy use in homes and pumps out 292 million metric tons of carbon dioxide (CO2) emissions each year. The more CO2 we release into the atmosphere, the more we hinder the earth's ability to maintain balance, which has a variety of negative implications. That's why, the less energy you use to heat your home, the better it is for Mother Nature (and your wallet!). 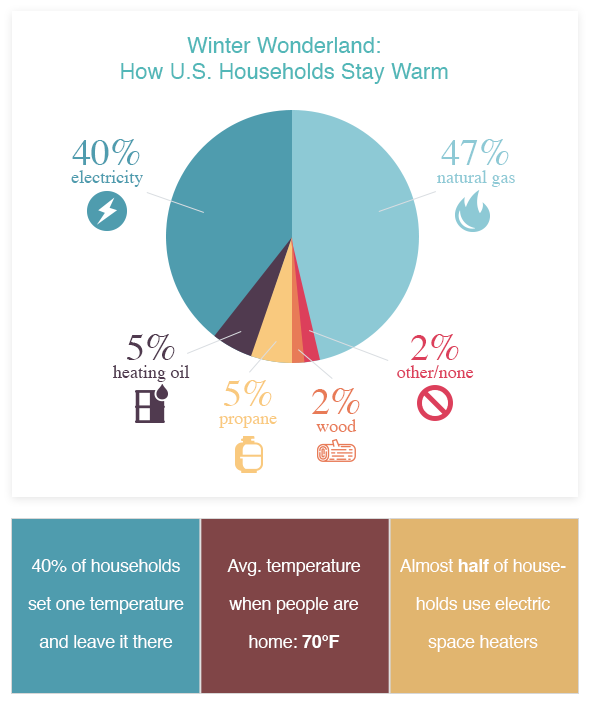 U.S. Energy Information Administration, Household winter heating in the United States. Air leaks are the primary culprit for excess energy consumption. If air is able to escape out or in, your furnace will just keep pumping out heat relentlessly. Get to the root of the problem by sealing these areas. Caulk and weatherstrip doors and windows, including your attic, basement, and garage access doors. Caulk openings around plumbing, duct work, and electrical wiring. Apply foam sealant on larger gaps around windows and baseboards, and place foam gaskets behind outlet covers. Add baffles around recessed lights if yours are not airtight. Install double-pane windows or cover single-pane windows with storm windows. For a cheaper option, purchase a plastic film insulation kit. Seal gaps around the fireplace with sheet metal/sheet rock and a high-temperature silicone caulk. Also, ensure your flue is closed when not in use. The U.S. Department of Energy recommends getting a professional blower door test to detect the source of air leaks, but in the interest of saving money, they also provide tips on how to identify air leaks yourself. According to the North American Insulation Manufacturers Association (NAIMA), 90% of U.S. homes are under-insulated. This is especially true for older homes, but it can even apply to newer ones. The EPA estimates that homeowners can save an average of 15% on heating and cooling costs by sealing air leaks and adding insulation in attics, crawl spaces, and basement rim joists. Visit EnergyStar.gov to learn how to perform a DIY insulation check for your walls and attic and to find out which insulation levels are recommended for your region and climate. If you're not comfortable with the DIY route, hire a professional to assess your insulation needs. Using the sun's natural light is an easy, environmentally conscious (and completely free!) way to heat up your house. As the sun beams down on your windows, it produces a greenhouse effect that traps heat inside. This works in your favor during the winter months, so be sure to open your curtains each morning to let the sun work its magic. On the flip side, remember to close your curtains at night (consider thermal drapes) to keep the warmth in. As you begin implementing the energy-saving tips provided above, your home should start to warm up and retain heat more efficiently. That means you shouldn't need to keep your thermostat set super high. During the cooler months, the U.S. Department of Energy suggests setting your thermostat to 68°F while you're at home and awake, and setting it lower when you're asleep or away. By turning your thermostat back by 7°-10°F from its normal setting for eight hours a day, you can save around 10% per year on heating and cooling costs. In addition to choosing the right temperature, a smart or programmable thermostat can make a big impact on your home's energy efficiency. You can program your thermostat for time-of-day usage, so you don't have to remember to turn the temperature down when you're gone or up when you get home from work. More advanced heating systems may even be configured to only heat rooms that you use, or to kick on or off when you enter or leave a room. Decreasing your energy consumption is an important first step in minimising the impact that heating has on the environment, and in reducing your energy costs. But we shouldn't stop there. Rather than relying on fossil fuels (like natural gas) to heat our homes, adopting renewable energy sources such as solar, geothermal, and biomass technologies can even further reduce your home's environmental footprint. While they may not entirely replace your current heating methods, these technologies can easily integrate with your existing system and supplement its heat production. Learn more about renewable heating options and their costs at EPA.gov. By taking steps to reduce the amount of energy you use this winter and adopting renewable heating alternatives, you'll save money, improve the comfort of your home, and make a positive impact on the planet. Those benefits alone are enough to make you feel warm on the inside, as well as the outside!